Monoclonal antibodies are used to treat cancer. They are large, complex molecules which may provoke an unwanted immune response. To try to remedy this, researchers are developing fragments of full antibodies (called ScFv fragments). These new classes of molecules, which simultaneously target tumor cells as well as substances produced by the immune system, have had successful clinical results and have potential for use in development of novel cancer treatments in the near future. In a study published in Protein Expression and Purification, researchers from Cornell University report the testing of a new ScFv fragment to treat prostrate cancer. Part of the process involved inducing a culture with a methanol feed. 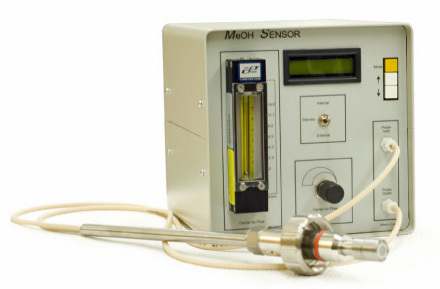 The researchers used Windmill Logger Software to interface the methanol sensor from Raven Biotech for data acquisition. A PID (proportional, integral, differential) control system maintained the methanol value at 0.1 g/L for the entire 96 hour induction phase. Samples were taken at 24 hour intervals. Windmill, running on a PC, collected data from the RS232 port of the methanol sensor system, regularly logging values. The researchers - Stephanie Parker, Ines Diaz, Kyle Anderson and Carl Batt - managed to design, produce and characterise a single-chain variable fragment (ScFv) derived from a prostrate specific monoclonal antibody. The methanol control-fed batch fermentation let them scale-up production of the ScFv making it possible to grow the organism to high cell densities. The ScFv produced can be used to make fusion proteins for treatment and detection of cancer growth. Windmill 7 Data Acquisition Software + COMIML Serial Driver, logging software to acquire data from instruments and sensors with RS232 ports.